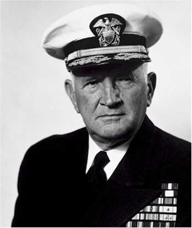 Jesse B. Oldendorf (1887-1974) was Executive Officer on USS West Virginia from 1935 to 1937. Graduating from the Naval Academy in 1909, his first command was USS Decator (DD-341). He served as Navigator on USS New York (BB-34) from 1930 to 1932. During WWII, he was Commander Cruiser Division 4 with his flag on USS Louisville (CA-28) and he was awarded the Navy Cross for his leadership during the Battle of Surigao Strait. In 1945, he was wounded when a Japanese torpedo hit his flagship USS Pennsylvania (BB-38) off Okinawa. He retired in September 1948 a Vice Admiral. The destroyer USS Oldendorf (DD-972) was named in his honor.